Ever so often I am asked what is the best baby scale to purchase? Most of the time it depends on several factors. Are you looking for a permanent setup or do you plan to carry the scale around to different locations? Do you need a scale with a seat or will just a flat platform work out for you? Those are just a few questions to consider when looking at a pediatric scale purchase. Using an infant scale is very important. You want a scale that is easy to use and reliable. There are many great choices in the market today, most imported from China. I’m not going to bore you with all the details of all forty five different models of baby scales that I’m aware of. Instead, I’m going to mention a few of the top brands and let you do a little research instead. In my opinion, the key brands of baby scales to consider are Detecto, Doran Medical, Health-O-Meter Professional, Rice Lake, and Seca. Detecto pediatric scales are designed with active infants in mind, equipped with secure baby scale trays or seats that are easy to clean. Filtering features and weight lock keys provide accurate, convenient readings for physicians and nurses working with newborns and moving infants. Each Detecto infant scale is built from high-quality materials that provide stability and support during the weighing process. Detecto offers a wide range of digital and mechanical baby scales to suit the needs of all healthcare professionals, including baby scales that are portable and appropriate for use in various conditions. EMR transmission is available through select models of electronic baby scales. The manufacturer also has portable carts available as well since nurses are usually wheeling these scales around the hospital or doctors office regularly. Doran Medical Scales prides itself on providing high quality medical scales for pediatricians and hospitals. The scales provide accurate information for your pediatric patients. The digital baby scales are available in several different configurations. There is a scale with seat. There is a scale without seat. Finally, there is the DS4300 which has been specifically designed to weigh premature and newborn infants. This neonatal scale can measure the weight of the tiniest babies to an accuracy of 0.1 oz. This precise neonatal scale features movement compensation technology that results in an extremely fast and accurate display. Even when the infant is moving, the DS4300 captures the actual weight. The last stable weight is stored and can be recalled at the push of the Last Weight button. This unique feature frees the nursing staff to care for the infant rather than the number on the scale display. Popular Health o meter Professional pediatric and neonatal scales are designed to accommodate the youngest and smallest of patients in any healthcare setting. The advanced pediatric scales feature motion sensing technology and provide fast and easy weight measurements. HOM also has medical carts available which are perfect for taking your scale on the go for portable weighing. Rice Lake offers a wide variety of medical scales as well. In fact, even the most active babies can be weighed and measured accurately, safely and quickly with the RL-DBS. The baby can be placed on the scale, quickly removed, and then have its weight recalled for charting by pressing the Recall key. Rice Lake’s battery or AC-powered RL-DBS digital baby scale can be placed anywhere in the facility. The RL-DBS digital baby scale is sleek, extremely durable, and easy to clean and maintain. Seca baby scales make weighing infants fast and comfortable, thanks to the skin-friendly materials that immediately take on and radiate body warmth, shapes that make the baby feel safe and intelligent functions that shorten the weighing process. So after reading all this information, you might be wondering what is the best baby scale for the money? The Rice Lake RL-DBS is my pick. 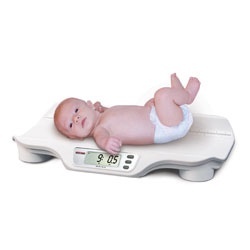 This scale is priced very reasonable at under $200 and is a great choice for weighing babies. Now I will say this, the scale is not super heavy duty. So if you are looking for a really high quality model of baby scale then you might want to look at a scale from Detecto perhaps. But for basic infant weighing, I like the RL-DBS scale. And as always, I like to mention that this is simply my opinion based on the information and sales that I have seen over the past few years.